The Whirlpool Galaxy, also known as Messier 51 or M51, is familiar to legions of amateur astronomers, a face on spiral gravitationally interacting with a smaller nearby galaxy. On clear, moonless nights, M51’s spiral shape can be discerned in relatively modest amateur instruments, a dim, ghostly body near the bright star Alkaid at the end of the Big Dipper’s handle. 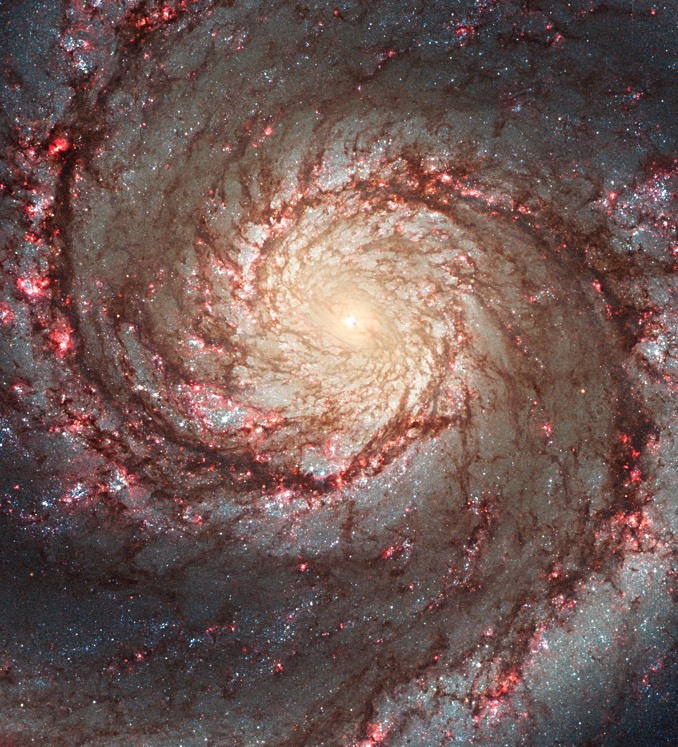 But through the Hubble Space Telescope, M51 is revealed in all of its jaw dropping splendour, a magnificent swirl of tightly-wound spiral arms, glowing regions of star formation and countless clusters. Gravitational interactions with the companion galaxy, not seen in this image of the Whirlpool’s heart, trigger star formation across M51 as seen here in bright clusters of energetic young stars highlighted in red. Also visible are numerous dust “spurs” extending away from the spiral arms in near perpendicular fashion. The origin and evolution of the spurs are not yet understood. 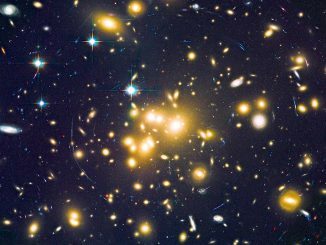 Galaxy clusters are often described by superlatives. After all, they are huge conglomerations of galaxies, hot gas, and dark matter, representing the largest structures in the universe held together by gravity. 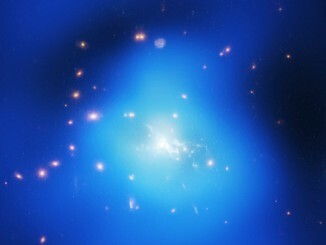 New observations of the galaxy cluster SPT-CLJ2344-4243 (or Phoenix Cluster) at X-ray, ultraviolet, and optical wavelengths are helping astronomers better understand this extraordinary system. 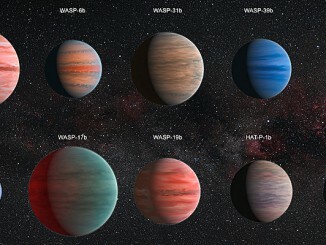 A survey of ten hot, Jupiter-sized exoplanets conducted with NASA’s Hubble and Spitzer telescopes has led a UK-US team to solve a long-standing mystery — why some of these worlds seem to have less water than expected. The findings offer new insights into the wide range of planetary atmospheres in our galaxy and how planets are assembled.